I set a 2500 mile goal for 06. It looks like 2200 will have to do. It could have been done easily, but I decided against commuting to work in the dark. The weather has been very cooperative but I'm not comfortable with the Taunton evening traffic. The Applichian Mountain Club ride for New Years Day looks like a wash. I had planned on working and gave the day away to go riding. The last time I rode with the club, I got three flats and had to call for a ride home. I still may ride on the first. The weather will decide. It was a strange week for the younger family members. Todd was hit while walking home in Atlanta, and left unconscious in the street. A broken nose was the worst damage, along with a few bumps and bruises. 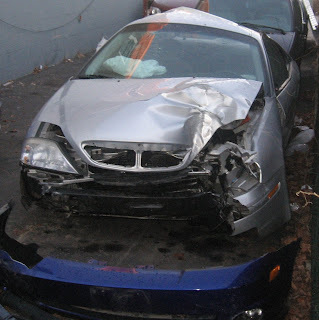 A few days later, Brandon totaled his car when he hit a wood telephone pole. He was doing about 40 and fell asleep. He does not have a cell, and ended up walking the 1/2 mile home. The police had already been there looking for him. As usual, I resolve to lose weight and ride more in 07. Last years goal of losing two pounds is lost. To meet that goal, I need to lose 12 lbs by tomorrow.